Mangaluru, Jan 29, 2018: Fear due to questioning by the Upa Lokayukta over pension money to a beneficiary saw the deputy director of women and child welfare department collapse on his knees at the hearing in Mangaluru on January 28, Sunday. Jayanti, a retired anganwadi worker, during a public grievance inquiry and disposal meet convened at the Zilla Panchayat auditorium, alleged that she was entitled to receive a compensation to the tune of Rs 1.25 lakh from the government for her service. However, she had so far received a paltry sum of Rs 33,000. This was because the details in her SSLC marks card and the pension identity card did not match. While her marks card stated that she was born on December 4, 1956, her pension ID mentioned that she was born on December 4, 1986. On hearing this, Subhash B Adi, Upa Lokayukta 2, grew furious and took Sundara Poojary, deputy director, women and child welfare department, to task. As Adi further grilled Poojary on the "serious lapse" and directed him to either reinstate her in the job - as she had still not attained superannuation according to her pension ID - or settle her remuneration within 10 days, Poojary admitted the error. However, he said he had no power to fix the lapse and had to contact the department concerned in Mumbai. Justice Adi was furious as to how the department could consider a 61-year-old woman as a 31-year-old as her physical appearance clearly established her age. As Justice Adi said, "Correct the error in 10 days or pay all her arrears and continue her in service," a worried and nervous Poojary lost consciousness. He was immediately administered treatment by the medical representative present during the meet. The doctors present at the venue told media that there was no danger to his life. 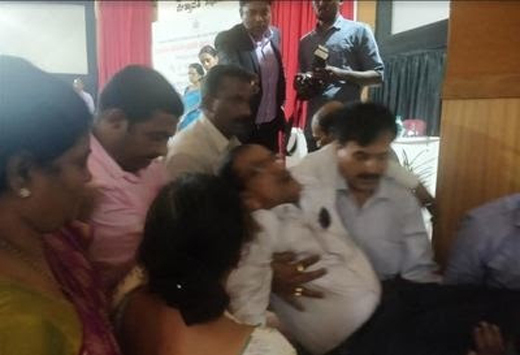 Incidentally, this is the third instance where Poojary has collapsed during a meet involving government and judicial representatives. He had earlier fainted twice when MLC Ugrappa, chairperson of the expert committee on Prevention of Sexual Violence against Women and Children, had grilled him, once at the same venue and another time at the DK DC office over some issues. Justice Adi promised the former anganwadi worker that she would get what was rightfully hers soon.